Tapering plates of nailhead Calcite from Shi Zhu Yuan mine, Chen Zhou City, Hunan Province, China. The calcite fluoreseces pink-orange SW. The piece weighs 1 lb. 3.8 oz. and is 4.7 x 3.0 x 2.9 inches. An unusual and new find of leaf veined calcite spears from Mirzapur, India. 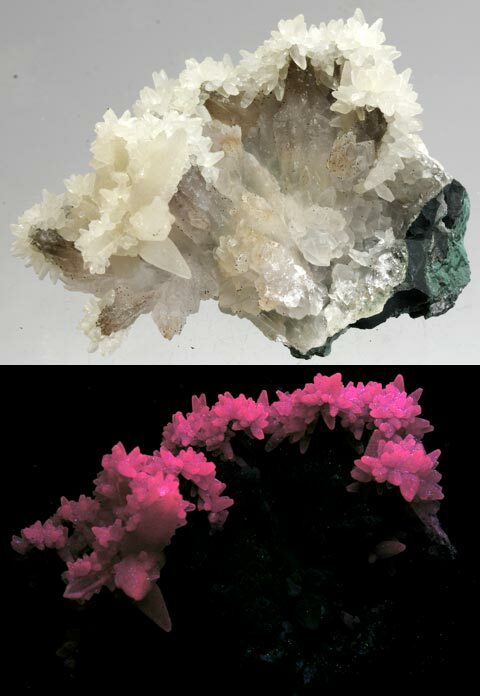 The calcite fluoresces white SW & LW and has a long phosphorescence. It weighs 0.6 oz and is 1.5 x 1.4 x 1.2 inches. Dark tan blades of dogtooth calcite crystals from St-Cyrille de Wendover, Quebec, Canada. 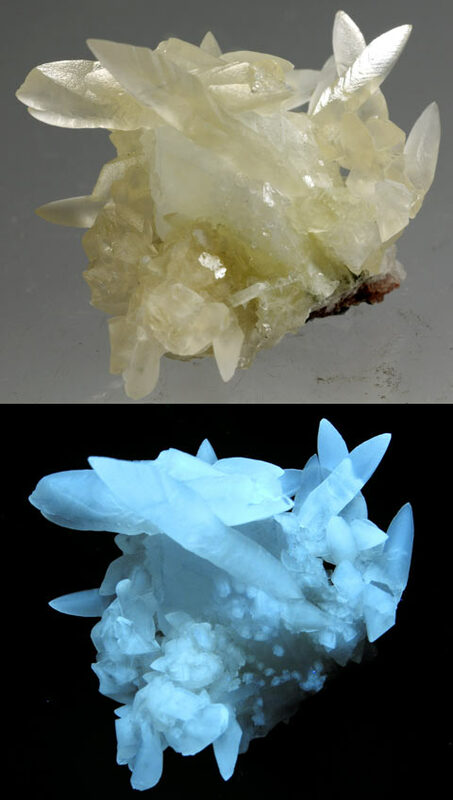 The calcite fluoresces blue-gray SW and green-beige LW. The piece weighs 5.0 oz. and is 3.0 x 2.5 x 1.5 inches. Lightning calcite from Copper Canyon, Magdalena Mountains, New Mexico. 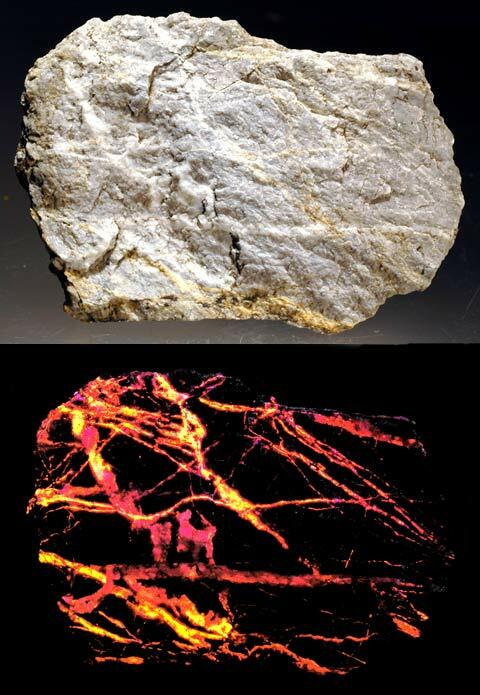 The calcite fluoresces orange SW in a lightning pattern across the rock. It weighs 5.0 oz and is 3.8 x 2.5 x 0.8 inches. A geode of amber spears of calcite on dolomite from Pune, Wagholi, India. 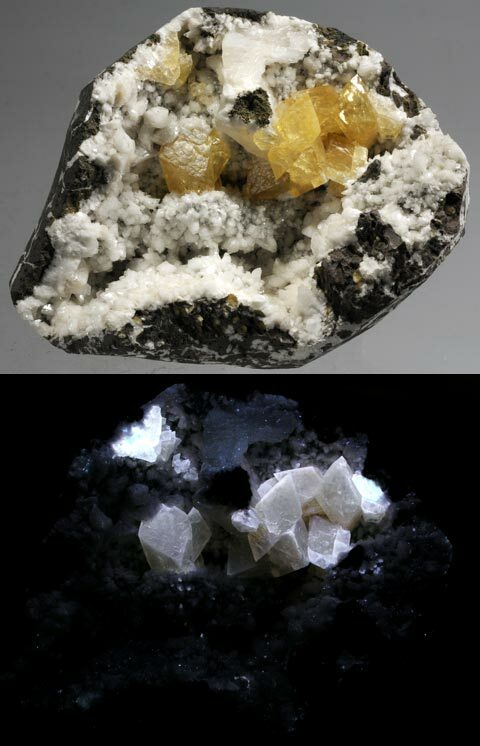 The calcite fluoresces yellow-white SW & LW. It weighs 16.0 oz and is 4.5 x 3.5 x 2.3 inches. Calcite spears from Irai, Rio Del Sul, Brazil. 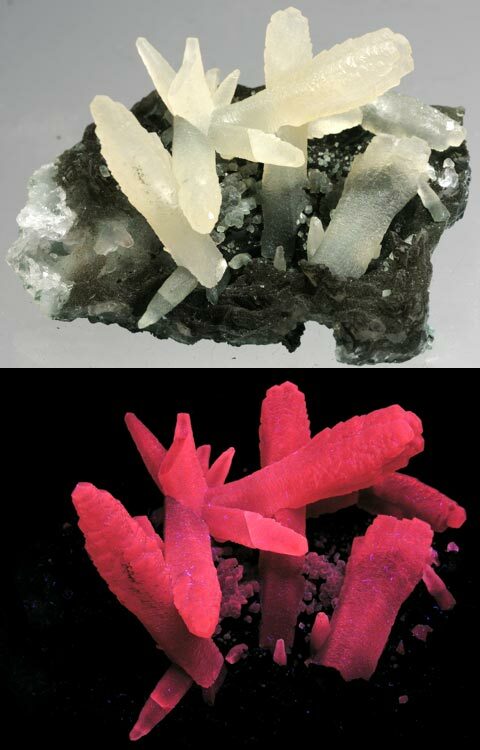 The calcite fluoresces pink red SW & LW. It weighs 2.0 oz and is 2.7 x 2.2 x 1.6 inches. Calcite spears and crystals on quartz crystals from Irai, Rio Del Sul, Brazil. 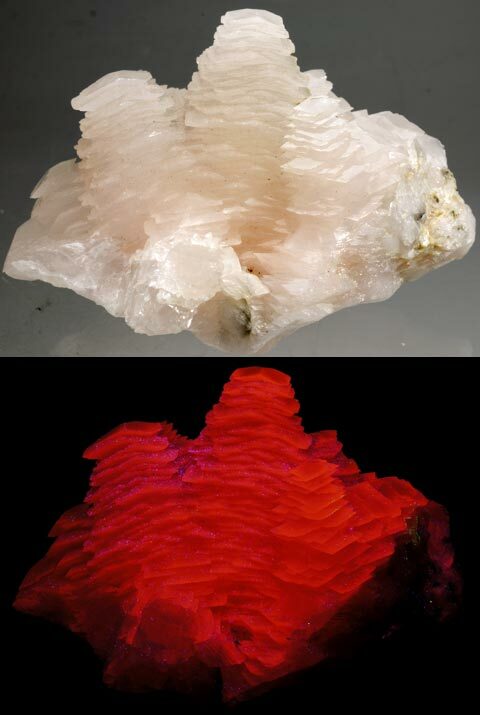 The calcite fluoresces pink-red SW & LW. It weighs 3.0 oz. and is 2.8 x 2.0 x 1.3 inches. Calcite crystals on analcime from Croft quarry, Leicester, England. The calcite fluoresces red-orange SW. It weighs 2.0 oz. and is 2.3 x 2.3 x 1.0 inches. 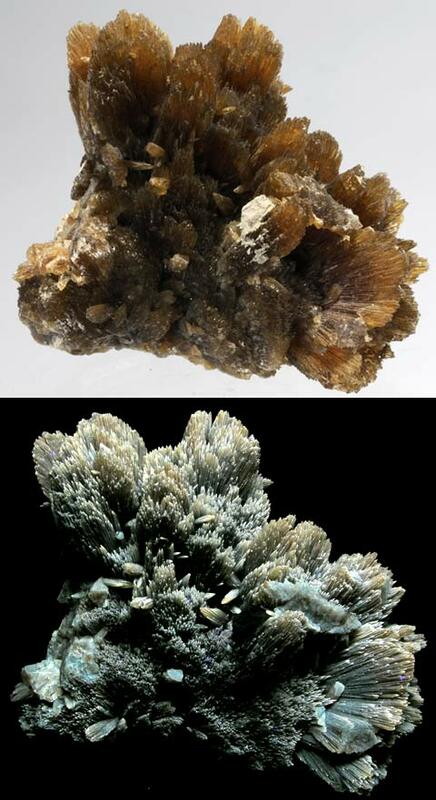 Aragonite (calcite family) in a spikey coral-like growth from Northern Lights mine near Yerington, Nevada. 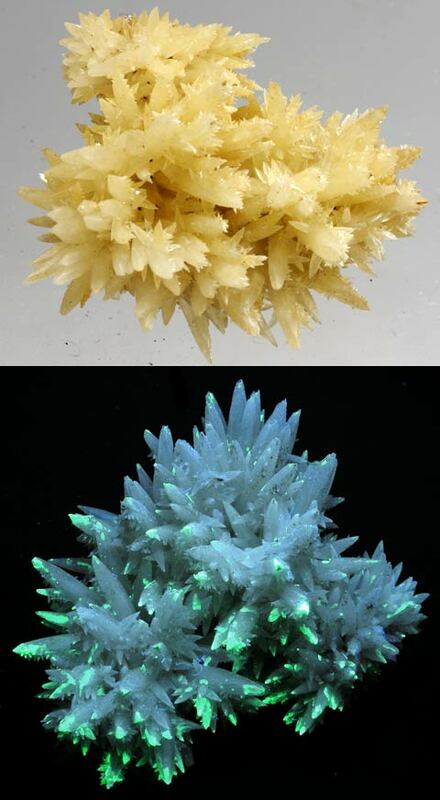 The aragonite fluoresces white with green tips SW and cream LW. It weighs 1.3 oz and is 2.0 x 1.5 x 1.5 inches. 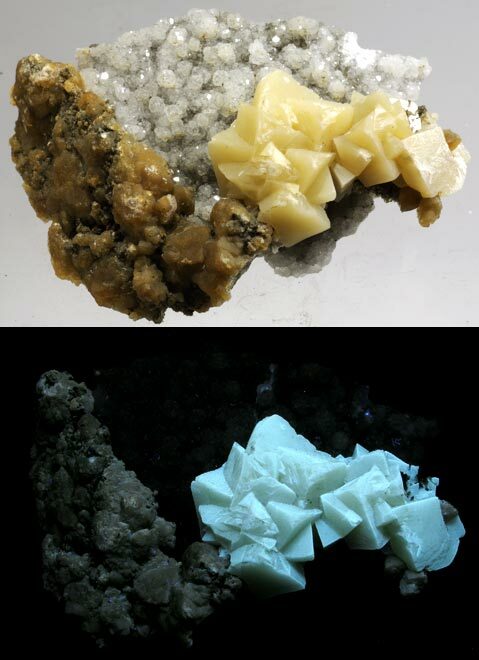 Calcite crystals on prehnite crystals from Roncari Quarry, E. Granby, Conn. 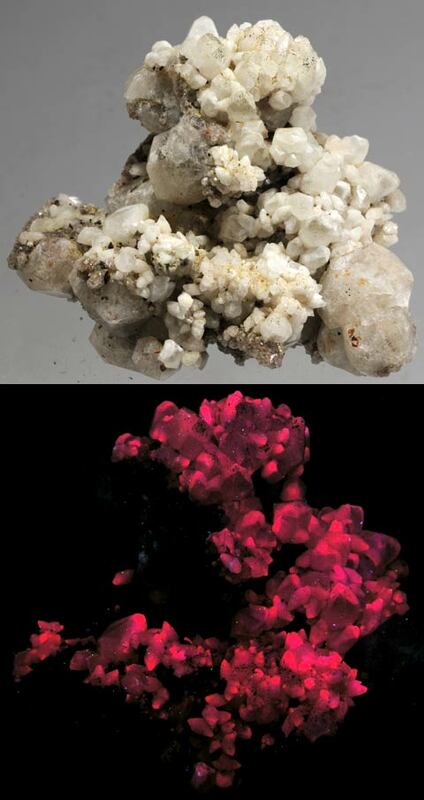 The calcite fluoresces red-orange SW. It weighs 2.5 oz. and is 2.5 x 1.5 x 1.1 inches. An exquisitely aethestic piece with two forms of calcite on analcime from Yamhill, Oregon. 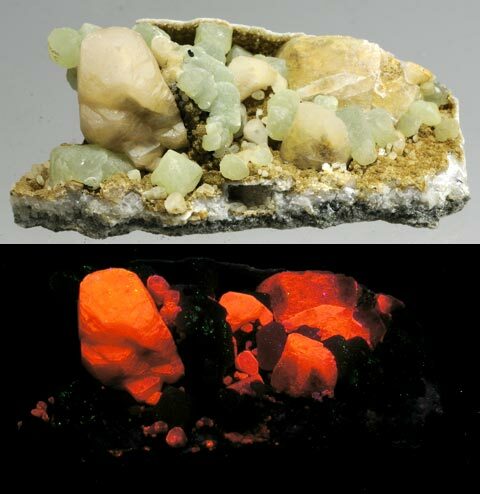 One calcite fluoresces pale yellow SW & LW, the other calcite fluoresces pale orange SW. It weighs 4.4 oz and is 3.4 x 2.3 x 1.7 inches.